Previous PostIs GINA really about to die?!? 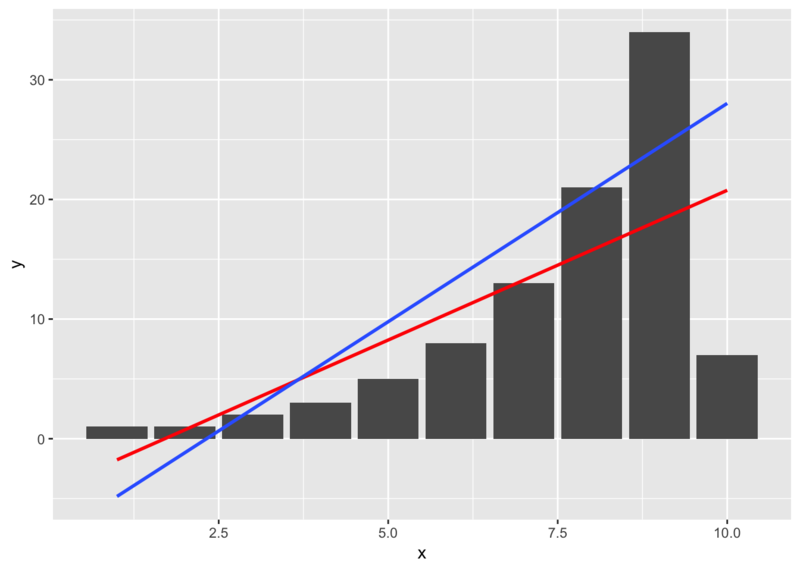 I think that the R code is neat, but the visualization is misleading. The bars give the visual impression that they represent numbers, but actually they represent rates: events per unit of time. The units of time are identical for all the bars, except the last one, which should be shown with a narrower width, For example, if the units of time are years, and the last count is for 3 months, the last bar should be 3/12ths the width of the others, and the height 12/3 of what is showing now (7 in your example). You’re right about what the data is intended to represent, and thank you for the interesting solution for this example. In the real world use, there are more than 10 bars, and altering the width of the last bar doesn’t convey the period information in pre-attentive fashion. Also, I’m using bars instead of other geoms so I can color by type and stack, which eliminates some other options like geom_line or geom_area. Another solution I happened to see to the misleading problem is traffic stats on WordPress mobile, which uses a projection for the remainder of the period that’s shown in a faded color. Providing a function to ggplot as data is interesting but I’m not sure it has a place with this particular use case since subsetting is much more efficiently done by the standard square brackets approach i.e. Also if you’re plotting time periods your time axis should only include *complete* periods. If you want to show current YTD growth you can do so by comparing this month to the same month in prior years. The visual should make it easy for the consumer to compare like for like.